On the day the Chinese announce the opening of a state-of-the-art nuclear power station––decades in the making––three British spies disappear. Coincidence, or retribution? With scores to settle––and a new technology to sell to the highest bidder––the Chinese will take no prisoners. And they know just who to turn to. Enter China’s answer to James Bond and Jason Bourne––revenge dispensed by their Shadow Man. From the author of The Last Prophet, comes that novel’s explosive sequel. The Shadow Man is Tim's first sequel – a follow-up to The Last Prophet. ★★★★★ His best yet – don't miss this one. Absolutely brilliant. This is Tim Heath's best novel to date and shows how much he is growing as an author. His use of English is excellent and there are no typos, misspells or missing words, so it's really easy to read. The story is a sort of continuation of a previous novel, The Last Prophet, but you don't need to have read it first as The Shadow Man further develops the plot and one of the characters introduced there. Tim has reached new heights for me, as he made me develop a real empathy for the main two characters and I became really involved, even though they were both really nasty people – that shows how good his characterisation is. The story moves along at a great pace and I found it really difficult to put down. This is a fantastic, well paced, engrossing novel and if you like thriller/espionage stories that will leave you feeling engaged, then do not miss this story. ★★★★ You hold your breath with it! A wonderful action thriller book that you can easily get hooked by it! It has not a single page that's boring! Just start reading it and you'll travel with your mind to so many countries and places that you have to hold your breath! I can't really understand the magic writing of Tim Heath. Every book of his is a different kind of perfect from the previous one… Magical writer. An intriguing action thriller sequel to The Last Prophet. Full of twisting, turning plot lines, fast paced and well crafted characterisation makes this a very absorbing read. Can be read as a stand-alone novel if you haven't already tried his previous offering(s). ★★★★★ Another Winner for Tim Heath! As with all of Tim Heaths books to date, The Shadow Man is full of twists, turns and intrigue. Continuing on from the Last Prophet novel, once you pick it up you will not want to put it down! A brilliant book that absorbs you into its magic. ★★★★ Another great spy thriller! 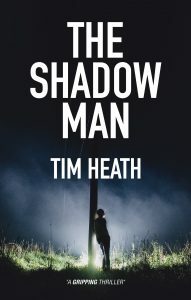 Have read all of Tim Heath's books and The Shadow Man is just as suspenseful and dynamic as Cherry Picking. Won't give away any spoilers but from the back-story of the shadow man to the last page, I was completely absorbed. Definitely worth a read! Follows on from The Last Prophet but can be enjoyed as standalone. As normal for Tim Heath a pacy, well-designed plot full of twists and turns leading to an unexpected climax. Recommended. A sequel to The Last Prophet, but also a stand alone book, as usual Tim kept us rapidly page turning to see what happened next. Absolutely loved this book. Very fast paced book with lots of surprises. I really enjoyed this latest thriller from Tim Heath. The fast moving story involves Britain and China, Africa and America, spies and jihadis. Will the Shadow Man be caught? This exciting story is actually a sequel to Tim's earlier book ‘The Last Prophet' but you don't need to have read that to enjoy this book (though I did think ‘The Last Prophet' was very good, so I'd recommend that too). Really pacey thriller. I've read it through twice already. Although a continuation of The Last Prophet it is also a stand alone and totally different to the Prophet. I continue to be fascinated by Tim's characters and the moral dilemmas he brings in his books which always set me thinking. Fast paced and love the staccato sentences delivering facts allowing us to get on with the story. Thanks for another great book Tim. This journey into the life of a somewhat minor character from The Last Prophet opens up a whole world of intrigue, tyranny, love and sacrifice. Building to a strong finale, matching personal desperation against government and agency plots, the story fizzles with angst and thrills, all the while setting the scene for more to come. Looking forward to seeing Gudu in action again!